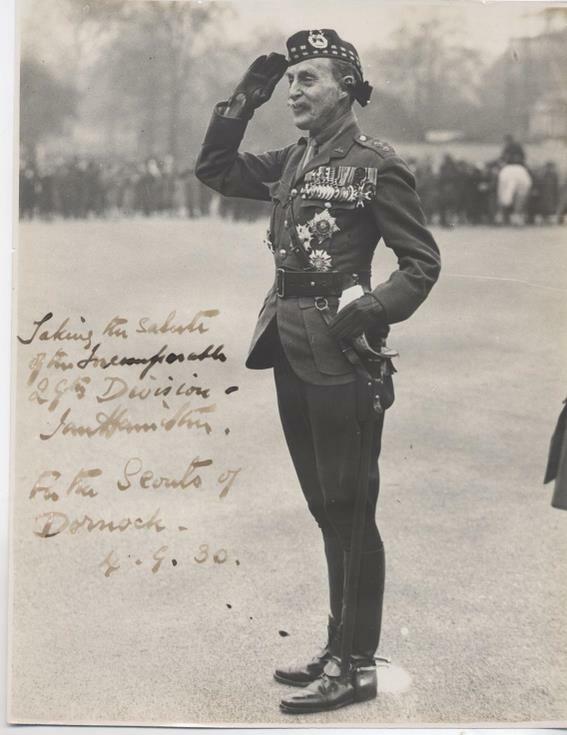 Sir Ian Standish Monteith Hamilton (1853-1947) was Commander in Chief of the Mediterranean Expeditionary Force in the unsuccessful campaign against Turkey at Gallipoli. Born on 16 January 1853 in Corfu, Hamilton served in numerous campaigns and roles in India and Africa in a military career which began in 1873. Having served in Afghanistan in 1878, he was appointed Lord Kitchener's Chief of Staff during the South African War of 1899-1902. Following the Boer campaign Hamilton received a knighthood in 1902. He was made Commander in Chief of British forces in the Mediterranean in 1910. He was therefore the logical (although to many surprising) choice to be placed at the head of the expeditionary force assembled in 1915 for the invasion of Turkey. He had earlier been placed in charge of home forces at the outbreak of war in August 1914. Appointed to his command of a force of 75,000 men on 12 March 1915 by Kitchener, Hamilton was tasked with seizing control of the Dardanelles Straits and with the capture of Constantinople. The failure of this campaign - considered risky and inadvisable by many even before it began, including Admiral Fisher (who strenuously objected to the dilution of the British Grand Fleet, and who consequently resigned in protest) - led to the end of numerous careers, including Hamilton's and, temporarily, Churchill (who instigated the plan). Hamilton spent six fruitless months unimaginatively bombarding the Turks at Gallipoli, making little progress but incurring severe casualties. He nevertheless remained optimistic with regard to the overall success of the plan, to the point of opposing Cabinet moves in London to initiate an evacuation. Made a scapegoat for the failure of the operation (despite being hopelessly undermanned and having faced formidable logistical difficulties), Hamilton was recalled to London on 16 October 1915, effectively ending his military career. He was replaced by General Sir Charles Monro who, echoing Hamilton's belated recognition of the futility of the campaign, immediately recommended evacuation.